MindMup is a web-based concept mapping application with a Google Drive connection. With it, you can capture your ideas instantly and creatively. The application allows you to focus on your thought development as well as it removes all on-screen distractions. With MindMup, you can create an unlimited number of mind maps free. You can store your ideas in the cloud for a limited time but you can save them to your Google Drive account or export them for long-term keeping. Moreover, MindMup gives you the ability to publish your ideas to social networks directly from its interface. With this feature, you can reach your audience or your colleagues immediately without having to send them emails. If you have modest mind mapping needs, you can use MindMup free forever. Though the costless version has limited capabilities, it still enables you to explore and develop your concepts. Meanwhile, if you need to create large-sized maps, MindMup has paid subscription plans as well for single users and teams. With these, you have expanded creation and sharing options. With MindMup, you can accelerate your mind mapping processes as the application features keyboard shortcuts. They only take a short time to familiarize yourself with and after a while, you can become a pro at saving time using them. MindMup’s interface is a frictionless one, thereby promoting focus. As such, you can get rid of on-screen distractions and put all of your efforts in developing your ideas. MindMup offers multiple export options so that you can share your concept maps and diagrams with your audiences seamlessly. You can choose to convert them into PDF or into PowerPoint files for presentation purposes. 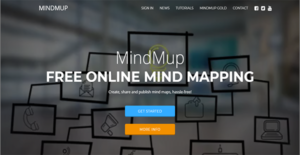 If you prefer to keep your mind maps on the web but wish to open them to others, you can do so with MindMup. The cloud-based diagramming tool lets you publish and share your thoughts publicly without having to convert them into other file formats. MindMup has the ability to connect with your Google Drive account, regardless of your subscription level. Thus, you can store your maps for as long as you want without losing them. Apart from that, paid accounts are afforded the ability to view and restore previous versions of maps on Google Drive. If you are interested in MindMup it could also be sensible to analyze other subcategories of Best Mind Mapping Software listed in our base of SaaS software reviews. Enterprises have diverse needs and requirements and no software platform can be ideal in such a scenario. It is futile to try to find a perfect off-the-shelf software system that meets all your business requirements. The smart thing to do would be to adapt the solution for your specific needs, staff member skill levels, budget, and other aspects. For these reasons, do not hurry and subscribe to well-publicized leading systems. Though these may be widely used, they may not be the perfect fit for your particular requirements. Do your homework, check out each short-listed system in detail, read a few MindMup reviews, call the maker for clarifications, and finally select the app that provides what you need. How Much Does MindMup Cost? Sauf Pompiers Ltd. has two levels of service for MindMup: free and paid. There are three options for enterprise pricing to suite teams of different sizes. Give the details a look, and select the best plan for your business. We realize that when you make a decision to buy Mind Mapping Software it’s important not only to see how experts evaluate it in their reviews, but also to find out if the real people and companies that buy it are actually satisfied with the product. That’s why we’ve created our behavior-based Customer Satisfaction Algorithm™ that gathers customer reviews, comments and MindMup reviews across a wide range of social media sites. The data is then presented in an easy to digest form showing how many people had positive and negative experience with MindMup. With that information at hand you should be equipped to make an informed buying decision that you won’t regret. What are MindMup pricing details? What integrations are available for MindMup? MindMup’s Organizational Gold subscription plan can connect to your Google Apps or Office365 domain. Those who have free subscriptions can connect their Google Drive accounts to the application. If you need more information about MindMup or you simply have a question let us know what you need and we’ll forward your request directly to the vendor.